Are you ready for Crazy Rich Asians? Because we, having read the book and obsessed over the adaptation's freakishly beautiful cast for weeks, still aren't fully prepared for how excited we are. The film version of the dazzling 2013 novel by Kevin Kwan stars Fresh Off the Boat's Constance Wu and Hollywood newcomer Henry Golding as the love-struck Rachel and Nick, who struggle to navigate the insanely lavish world Nick's family inhabits in Singapore. Now, courtesy of Entertainment Weekly, we have our first look! Correspondent Shirley Li spoke to the pair about the simple romance at the heart of the story, which doesn't get buried despite the over-the-top antics of Asia's über rich. "This is about a girl going somewhere that's foreign to her, to really find out who she is," Wu explained. "It's just such a beautiful story, to show an Asian-American immigrant going back to Asia and finding the things that overlap and connect us all, things like family, things like love." With the exception of 1993's The Joy Luck Club, few mainstream Hollywood films have boasted an exclusively Asian cast. When news about the adaptation was first announced, many fans feared yet another whitewashing situation might be on the horizon, but thankfully director Jon M. Chu refused to let that happen. "There's the feeling that if you don't make a great movie, then all of this is for nothing," he told Li, noting that this step in the right direction is hopefully the start of a trend. "We need many stories. We need another rom-com that's totally different from Crazy Rich Asians. There just needs to be more." After developing a giant spreadsheet that "looked something like an Asian IMDB," Chu was able to wrangle a selection of incredible Asian actors to bring Kwan's story to life on screen. "I think we now have the deepest database of Asian actors that speak English in the world. It was worth it. The best thing we ever did on this movie was cast this cast." You can say that again. 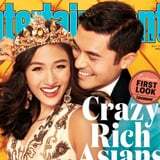 The film adaptation of Crazy Rich Asians is set to hit theaters on Aug. 17, 2018.